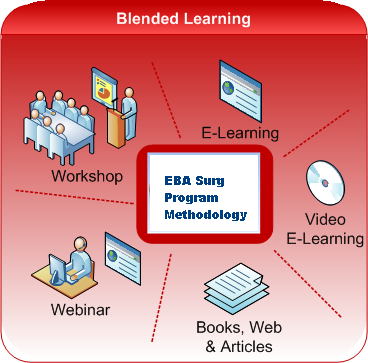 EBA surg is is a web-facilitated learning resource for bowel surgery .In EBA Surg program,learning combines face-to-face learning sessions and technology based materials to deliver educational information. In EBA Surg , learning focuses on optimizing achievement of learning objectives by applying the “right” learning technologies to match the “right” personal learning style to transfer the “right” skills to the “right” person at the “right” time. (By Harvi Singh and Chris Reed, Centra Software 2011). The Essentials of Bowel Anastomosis (EBA) Surg web site was founded in collaboration between the TruthSoft LLC, and the founder Dr.Ahmad Zarour , a consultant General &Trauma /GI and Minimally Invasive surgeon , at Zarour Clinic , Amman- Jordan to develop this training program in bowel resection and anastomosis. In addition, the EBA Surg model provides the opportunity for members to post additional educational materials specific to their experience in bowel resection and anastomosis. In 2009, the EBA Surg Program website was enhanced to a new software platform developed at TruthSoft LLC , Amman – Jordan , Subsequent upgrades in software were made in 2010 and 2011 to permit the program to broaden it's scope and to expand the EBA course offered to our participating students. As of 2012, more than 100 candidates successfully completed the EBA Course. The EBA Surg Program could not remain dynamic without the great efforts of the EBA Surg developer and support group at TruthSoft LLC .